Whether you’re a first-time guitar buyer or a professional with G.A.S. and a limited budget, there’s never been a better time to be in the market for an affordable new guitar than the present. While it’s been pretty easy to find a good electric solidbody with basic features and above average playability in the sub $500 range for the last 10 or 15 years, most of these instruments featured hardware, electronics and materials that placed them in the entry level category, making them useful only as temporary solutions before necessary upgrades. Recently the gap between entry level and professional guitars has become a lot narrower, as have the choices in the sub $500 range. When we looked at Mitchell’s HD400 and TD400 models a few issues ago, we loved how both models offered quality, playability and modern, custom design aesthetics normally only found on instruments costing two to four times more. 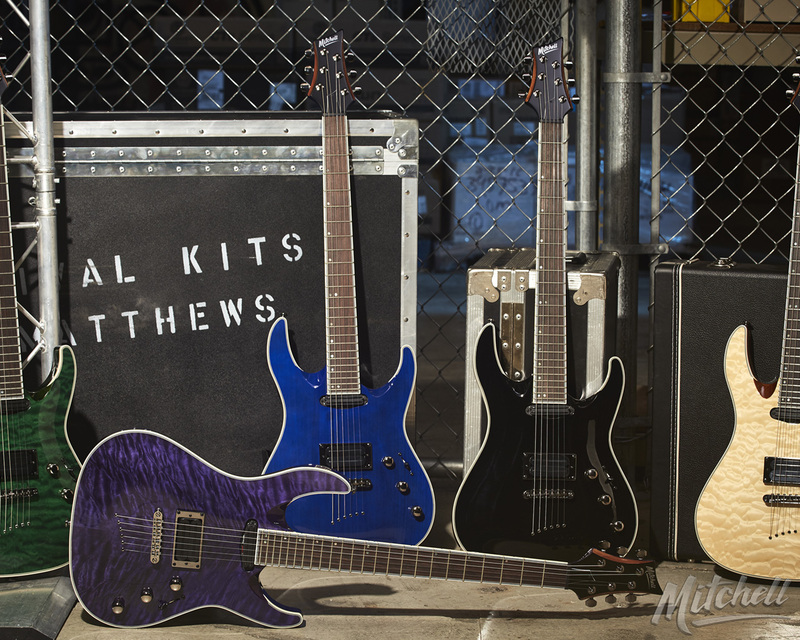 Both of those models featured bolt-on necks, which we figured helped Mitchell keep construction costs at a minimum, but when they later sent us their MD400 and MS400 models, which both feature glued set-in necks, we were thrilled to discover that the overall quality and price remained the same. The MD400 and MS400 also boast modern designs normally not found in this price range, along with upscale appointments and details that emphasize performance over the typical cost-cutting measures. The MD400 features an asymmetrical “Strat”-style double cutaway body, but with more contours and an arched top, the aforementioned set-in neck, and a dual pickup configuration. However, this is not the typical “super strat” as it also features a 3+3 tuner configuration on the headstock, a slim, seamless contour where the set-in neck joins the body, and a neck and body made of mahogany. Our example had the transparent forest green finish with AAA quilted maple veneer top also featured with the transparent purple and natural finish versions, while the black and transparent ocean blue finish models have a carved mahogany top. The body top and Indian rosewood fretboard are bound with five-layer binding. The neck provides 24 tall/narrow medium jumbo frets (slightly bigger than “vintage” frets), a 25 1/2-inch scale, 15 3/4-inch radius, and shallow “C” profile, and the back of the neck has a gloss finish that matches the body. The MD400’s electronics consist of an alnico V mini-humbucker with dual rail polepieces at the neck, a full-size alnico V humbucker also with dual rail polepieces at the bridge, individual volume controls for each pickup, a master tone control with pull coil tap function and a three-position blade pickup selector switch. Hardware includes knurled metal control knobs, a tuneomatic-style bridge with string-thru-body tailpiece, metal bridge pickup mounting ring and 18:1 die-cast locking tuners, all boasting a black nickel finish. The MS400 has a modern single-cutaway design, and like the MD400 it also features a mahogany body and mahogany set-in neck with Indian rosewood fretboard. Upscale details and upgrades include flame maple binding surrounding the arched top and fretboard, comfortable belly and cutaway contours, slim neck heel and custom dual “slice” fretboard inlays. Neck features include a 24 ¾-inch scale, 11.8-inch radius, 22 jumbo frets and shallow “C” profile. The MS400 provides a pair of alnico V humbuckers and also has individual volume controls for each pickup and a master tone control with pull coil tap function. Hardware includes 18:1 die-cast locking tuners, vintage-style “top hat bell” control knobs, tuneomatic-style bridge (also with string-thru-body anchoring), and three-position pickup toggle switch. From the second one picks up the MD400 or MS400, it’s obvious that quality was the primary concern of its construction. Each guitar is set up to play perfectly out of the box, requiring at most a simple truss rod adjustment to adjust for climate. The finish, binding, contour curves, fret work and more are simply stunning, but what’s even more impressive are the “little” details, like the way the cavity for the output jack is angled to keep the cable out of the player’s way or how the MS400’s control knobs are recessed for playing comfort. The pickups also deliver their own distinct personality, with a voice-like midrange, tight bass and tonal versatility thanks to the coil-tap function. These are the kind of details that were previously non-existent on guitars selling for less than $500. • Both the MD400 and MS400 feature set-in necks and bodies made of mahogany, Indian rosewood fretboards, and string-thru-body design. • The MD400 has an alnico V mini-humbucker with dual rail polepieces at the neck and a full-size alnico V humbucker with dual rail polepieces at the bridge. 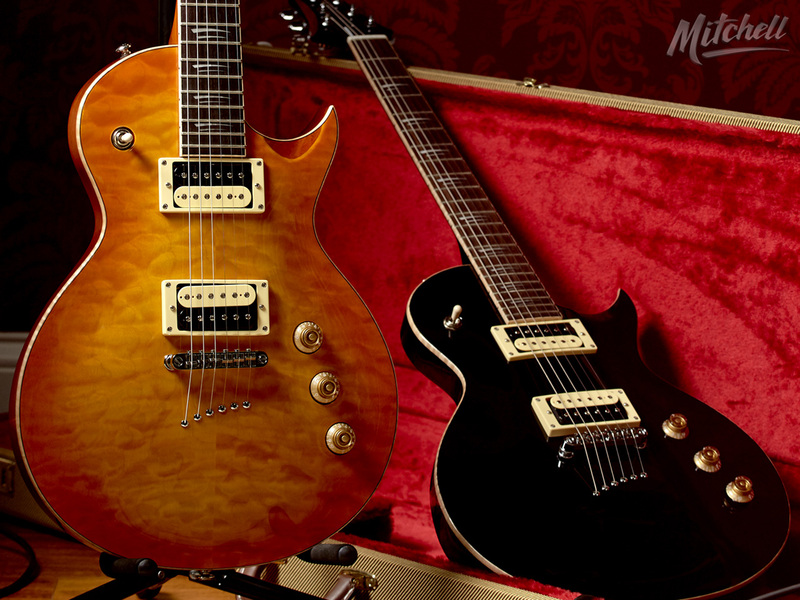 • The MS400 has a pair of full-size alnico V humbuckers with exposed zebra coil bobbins. • Both offer upscale details like coil tapping, a recessed and angle output jack, fancy fretboard and body binding, and pro-quality electronics and hardware. If you love the features, playability and style of a high-end custom solidbody but have an entry-level budget, the Mitchell MD400 and MS400 offer unbeatable value for a pro-quality ax that will last a lifetime.